Our one day Jordan River Baptism tour begins in Jerusalem, where one of our private tour guides will come and collect you (and your group) from your hotel. From there you will be whisked away for a full day of insight, revelation and blessing as you begin to walk in the footsteps of Yeshua (Jesus). The tour begins with a departure from Jerusalem to the East. You will be driven towards the Jordanian Border and home to one of two sites traditionally attributed with the Baptism of Yeshua by John The Baptist. Qasr el Yahud (Bethany by the Jordan) is the more likely of the two possible locations, due to its proximity to the Mount of Temptation, and today is one of the most visited locations by Christians visiting Israel. On route to Qasr el Yahud, you will visit a whole host of locations including: *Wadi Quelt, the Old Jericho Road, the Old Pilgrims road and of course the Jordan River. 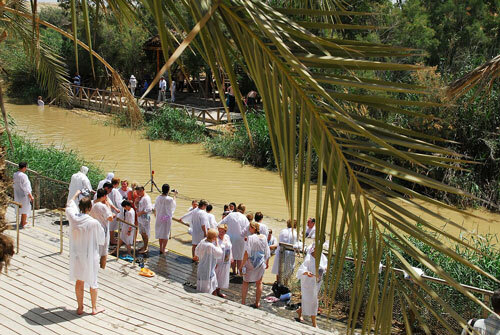 Here you will be given the opportunity to be baptised at the very site where Yeshua is said to have been immersed by John. After your baptism our guides will follow the biblical narrative and head out towards the Mount of Temptation, where Yeshua was tempted after fasting for 40 and 40 nights. At the mount, you will taken to the precipice for a spectacular view of the Judean Wilderness and the ancient city of Jericho. Upon you return back to earth, you will then have the opportunity to take a closer look at Jericho, with visits to the Ancient walls which came tumbling down as well as a visit to the traditional site of Elisha Well. Time permitting, we will then begin our journey back towards Jerusalem with stops at the Dead Sea (for a swim) and *Qumran to learn about the discovery of the now world famous Dead Sea Scrolls. What are you waiting for – Book your tour today for a once in a lifetime experience. Tour Option: Due to popular demand the baptism tour can now be done in two ways – as listed above or with the addition of Bethlehem. Please see the ‘includes’ tab above for more details. PLEASE NOTE: This is a PRIVATE TOUR with PRIVATE TRANSPORTATION. The only people on this tour will be your own group of people and one of our tour guides. This is not like other tours been offered by other companies which often have groups sizes of 20 – 50 passengers (and where the first 1 – 1.5 hours is spent collecting people from various locations / hotels before commencing the tour). By booking this tour you will have your own PRIVATE guide for the full day along with PRIVATE transportation. In addition, all entry fee’s ARE included in the prices of ALL of our tours. Many companies offer tours which don’t include entry fee’s. The one day private Baptism tour can be amended to suit people with walking impediments – please contact us for details. For prices and more information, please see the ‘prices’ tab above. For group discounts, please email us directly. Please fill in the form below to request your one day baptism tour and someone will contact you ASAP. ie. Your Hotel Location, a city (Jerusalem, Tel Aviv, ...) or a known Location. Where do you want dropped off?